Relevance Nanog is a transcription factor critically involved with self-renewal of undifferentiated embryonic stem cells. Human NANOG protein is a 305 amino acid protein with a conserved homeodomain motif that is localized to the nuclear component of cells. The homeodomain region facilitates DNA binding. Overexpression of Nanog in mouse embryonic stem cells causes them to self-renew in the absence of Leukemia inhibitory factor. In the absence of Nanog, mouse embryonic stem cells differentiate into visceral/parietal endoderm. Loss of Nanog function causes differentiation of mouse embryonic stem cells into other cell types. NANOG overexpression in human embryonic stem cells enables their propagation for multiple passages during which the cells remain pluripotent. Gene knockdown of Nanog promotes differentiation, thereby demonstrating a role for these factors in human embryonic stem cell self-renewal. 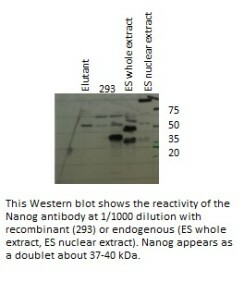 Antibody JT1 was applied in the 2008 NCB paper below and is available as immunogen affinity purified in PBS. Purification method: A Pierce kit was used. GST-Nanog 1-95 was coupled to the beads for 6 hours. The beads were then incubated with JT-1 terminal bleed.The column was eluted using Gly buffer pH 2.7. Subsequently aliquots of 1ml were mixed with 100ul of 1M Tris pH7.5. The aliquots containing the majority of the antibody were mixed with 12ml of PBS to perform a buffer exchange three times. Finally the total volume was reduced to 1200ul (at 1.6 ug/ul). Torres et al. 2008. Nat Cell Biol. 10(2):194-201. PMID: 18223644. Nanog maintains pluripotency of mouse embryonic stem cells by inhibiting NFkappaB and cooperating with Stat3.